Electrical boxes for outlets, light switches, and other devices are expected to contain both the back of the device and the wires leading up to it. 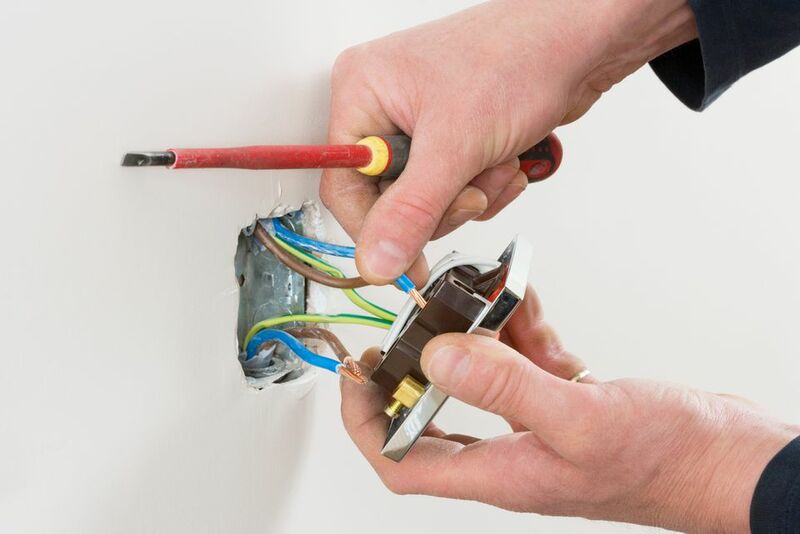 One frustrating aspect of electrical work is pushing wires into the box after you have connected the device. Boxes always seem to be too small, devices too big, and wires too numerous. Is there a way to accurately gauge the types and quantities of wires that go into a box? Yes, this can be done quite easily with plastic boxes and almost as easily with metal boxes. Once this is determined, there are a few tricks to safely pushing the wires into the boxes. As determined by the electrical code, electrical boxes have limits as to the type and quantity of wires they can accommodate. The plastic coating of wires that are too tightly packed can fray along stress points, potentially shorting out, arcing, or creating any number of safety hazards. Single Gang Boxes: A total capacity of 18 cubic inches allows for 9 #14 gauge wires, 8 #12 gauge wires, or 7 #10 gauge wires. This is a wires-only capacity. With one device added to the box, subtract two wires in each category. Double Gang Boxes: A total capacity of 34.3 cubic inches allows for 16 #14 gauge wires, 15 #12 gauge wires, or 13 #10 gauge wires. When two devices are added to the box, subtract three wires in each category. Do you really need 12 gauge wire for that circuit? Dedicated lighting circuits, for example, only need 14 gauge wire and 15 amp circuit breakers. The 14 gauge wire allows more wires per box and is far easier to fold than 12 gauge. Remember, though, you can only reduce wire gauge if allowable by code. With electrical boxes, it is difficult to go wider, but you often can go deeper. One example is the common plastic "old work" or remodel box, the type of box that clips onto drywall rather than attaching to a stud. The 14 cubic inch single gang box is suitable for many applications. But there is also a single gang 20 cubic inch box that is better because it is deeper, allowing wires to push in more easily. As long as you have enough space in your wall cavity, there is no reason you should not use a deeper box. To better fit wires into boxes, use more wire. While this may seem counter-intuitive, it does work. No, do not use a greater quantity of wires. Instead, provide longer sections of wire sticking out of the box. This makes the wire easier to fold, and folding is the way to get wires into boxes. With 6 inches of wire protruding from the box, it is possible to make one or two good folds in the wire, accordion style. With short wire, you cannot do this. Besides, longer wires make it easier to connect the device. Use a wooden shim or a screwdriver handle to make a sharper fold in the wire. Just be careful not to put undue stress on the wire. If you want to use pliers, wrap the pliers head with electrical tape or duct tape to prevent abrading the wire. Sheathing is the thick plastic coating that binds multiple wires. Too much sheathing only steals room from your electrical box. You only need a very short section of sheathing protruding inside the box. If you rip sheathing with the wire in the box, it is nearly impossible to cut it to down so far. Instead, insert the cable in your box, mark the entry point with a Sharpie, remove, and rip to the proper length.